Until just recently, I struggled big time with Chinese, Japanese, Korean and any other cuisine requiring stir frying of foods. I could whip up intricate French pastries and make a complicated Indian curry, but ask me to throw a few vegetables into a pan with some sauce without overcooking and over dousing, yeah, it was a Herculean task for me. I bought carbon steel woks and lovingly, took hours seasoning them and then, I bought large expensive fry pans when I was told they would suit the kitchen stove better. The stir fries got better, but they were still pretty erratic. I didn’t give up though! Back in April or May of last year, I came across an electric wok made by Breville in one of Williams and Sonoma’s catalogues. I checked online for reviews and ratings and found that it got excellent reviews. The wok has heating elements that heat the entire surface of the wok and so, the wok heats quickly and stays hot throughout the cooking process. Well, of course, I had to have it! I have to say, it’s one of my most used appliances in the kitchen. It’s perfect for so many things. The first week I had it, I think I used it everyday and it definitely paid for itself in a couple of months. So, the improvement in my stir frying ability was definitely thanks to the electric wok! The heat is great at searing the meats and cooking the vegetables crisp tender. It’s a nice and spacious wok so you can toss large amounts of noodles and not make a huge mess. I’m not selling anyone on the wok but if you’re having trouble like I had, this might help you. You can use it for more than stir frying; I make Thai curries, Indian curries, Indian stir fries, it acts like an Indian cooking wok called a kadhi. The noodles used for this Chap Chae Noodles are made from sweet potatoes. They are delightfully chewy and retain their shape and don’t get gummy. I adapted the recipe to what I had at home but kept the seasoning the same. The Saveur recipe didn’t include any hot sauces or condiments and I think some additions would go perfectly with this. It’s a great noodle dish and I really love the noodles themselves. I love their texture and like most noodles, they themselves don’t have any flavour but absorb the flavours around them. Korean sweet potato noodles stir fried with sliced beef and vegetables. Soak the noodles in boiling water until they are tender, drain and keep to the side. Add the sliced beef to the sugar and 2 tablespoons of soy sauce and allow to marinate. In a wok or a large skillet over medium high heat, add a tablespoon of oil and cook the onions, mushrooms and the peppers. Once they soften and are beginning to brown, add the broccoli and another tablespoon of oil. Cook the broccoli till crisp tender and then remove the vegetables to a bowl. Drain the meat from the marinade and add to the pan with the garlic. Cook until browned about 4-5 minutes. Add the soy sauce and sugar and once the sugar is dissolved, add the vegetables back. If your pan is large enough, add the noodles to the pan and toss around. If not, then remove the meat and vegetables into the bowl with the noodles and toss through with your hands. Add the green onions, sesame oil and the sesame seeds before serving. Serve with lots of sriracha sauce or other hot sauce. I hope you try these noodles if you haven’t before. What are some things you guys struggle with? Have you succeeded in over coming the hurdles? I guess practice and perseverance (and good kitchen electrics) does make perfect! this dish is not that easy to photograph actually, salute with your skills my friend! Thanks Kat! The new store should be a great resource for you. Your noodles look great Nazneen – asian cookery is an area I really need to work on. It can be so delicious and I hate being at the mercy of restaurants and takeaways, especially since good ones are pretty much non-existent here! I’ve never eaten anything like this, but will be trying it! Sweet potato noodles, I am hunting it right away. Thanks so much for introducing it to us. Love stir frys, a good wok is definitely helpful. Nazneen, it looks so so good, I cannot wait to try it out. Stir fry is best made at home. I will get back to you when I get my hand on the noodles. Thanks Asha, hope you can find them. Should be quite easy in CA, any Asian store will have them. Nazneen, that photo of those noodles/beef on the chopsticks is absolutely gorgeous. That is front cover magazine quality! I bought sweet potato noodles at the Asian market a couple of years ago and had no idea what to do with them or how to cook them. I’m really looking forward to buying them again and trying this recipe. Thanks so much for sharing. I”m pinning this one. I bet it goes Pinterest viral. I own that same wok! It really works well, and has improved my making of stir-fry dishes immensely. I forget where I heard about it, but have had it for several years – it’s definitely a great appliance. Anyway, great dish. I’ve never cooked with sweet potato noodles, nor do I think I’ve ever tasted them before. They sound wonderful! In fact this entire recipe sounds terrific. Good stuff – thanks. Hi John! I didn’t realise that they’ve been around for so long. I was surprised I hadn’t seen the Breville one sooner. It didn’t take me too long to get down there and get one! I love it. Try these noodles John, I think you’ll like them. Makes a change from the usual rice or wheat noodle. I’ve never known what to do with sweet potato noodles even though our market has like 20 different kinds. I’m going to try this out next week! Thanks Sarah! I hadn’t even noticed them at the store until I went looking specifically and then of course, I too found 20 different kinds!! Thanks for stopping by! Woow, this is sooo nice. I am not struggling at all in eating from the Asian cuisine :). I am struggling though with using the chopsticks. Gonna try your recipe for sure. Thank you Amira! I hope you like them, they are really good! I also have zero experience with this kind of food. Occassionaly I might make a stir fry with the sauce you can buy from a supermarket, that’s it LOL. You did a beautiful job here! I’d be happy to get this in a restaurant. Just about everyone has suffered sticky noodles, soggy pasta and vegetables at some point of their life and had learn from mistakes. I don’t have carbon steel or electric wok but I do have two indian style hindoleum skillet that works for my family. I struggle when I have to cook for more people and have to cook in batches and was always thinking to buy a good wok. Now after reading such a good review about breville electric wok I am considering to buy. Your chap chae noodles look delicious and I don’t think I ever tried this kind. Thank you Balvinder. This wok is a nice size so it would work for at least 8 servings. Like I mentioned, it works like an electric kadhai and I love it. These noodles are great and only have sweet potato starch and water. I think you’ll like them. Oh Nazneen…..what an AMAZING dish! I’ve not heard of sweet potato noodles before. Admittedly, I don’t do a lot of stir frying….for ALL of the reasons you’ve mentioned above. The way some people are nervous about working with yeast…..that’s how I feel about woks. Perhaps I should invest in the electric one you recommended. Because I would absolutely love to have this for my dinner one night! Those noodles in chap chae are made with sweet potatoes?! No wonder I love it so much! : ) This looks wonderful! I adore this dish and get it without a doubt when we have Korean food. And I also love Breville products…the electric wok sounds great. I’m a little embarrassed to say I must have much lower standards than you do when it comes to my stir-fry. I do it all the time and I admit I don’t get enough heat under there either! I love the texture of this noddle and yours just look so good…and you know what? You just reminded me that I still have of this noodle in my cupboard. Thank you Juliana! I’m glad I reminded you! I want to see what tasty thing you make with them! Those noodles are amazing. I’ve never seen or heard of them. Looks a very tasty dinner to get stuck into, as best you can with chopsticks! Thanks David! They were really quite good and I loved the chewy texture of them. I never knew about sweet potato noodles! All your dishes look so scrumptious to me. This included. I have a wok for the stove but it is nice to know about the electric kind. I’ve seen them, but have never heard about anyone using them. Great idea! The Breville one is incredibly fantastic as are all Breville products. It heats up hot and stays hot, I love it! These noodles are really good, very good at picking up flavours and sturdy too. Hi, Nazneen! What a well-composed dish…I love noodles and this Korean dish looks quite comforting…A complete meal! Denise Browning@From Brazil To You recently posted..Bife à Cavalo (Horseback-Riding Steak)…What? Thanks Denise! It was really quite tasty! I’ve never had sweet potato noodles before – they look lovely – translucent almost! 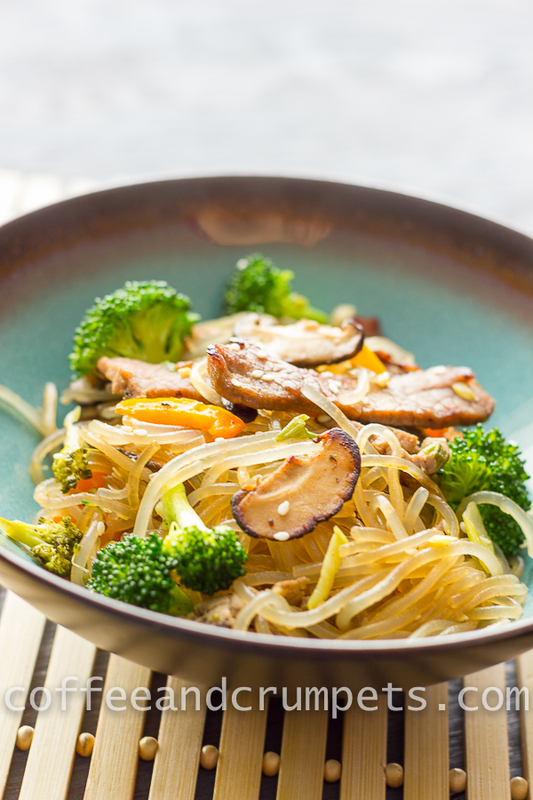 Congrats on persevering – this stir fry looks awesome Nazneen! Hi Shashui! yes, they are translucent even before cooking. They are very pretty and tasty too. P.S. – we made your chicken kebabs again last night – they are amazing! Our new favorite “go to” dish for weeknight entertaining! This looks delicious. Two new things for me to try, an electric wok and sweet potato noodles. And I thought I’d tried everything! Thank you dear Hilda! I hope we never stop finding new things to try!! Pad Thai is my absolute nightmare. The key to pad thai is to make 2 servings at a time, but who has that much time?? I always end up just making a big wokful and pray it doesn’t come out soggy!! Yes, I am doing that now. I try and mix like ingredients together and if I’m feeling lazy, then dump most of them together, but you are right. Separately they do much better. I am serious…this looks better than the stuff we eat at our neighbourhood restaurants. And I am talking authentic Korean. I admire your spirit in not giving up despite failures. I am like that too and you know that I LOVE noodles. I enjoy a few challenges here and there and the kitchen has not been far behind. Love these pictures…gorgeous! I struggled for the longest time with stir fry as well. We ate soggy, overcooked vegetables for so many nights as well. I use an electric wok these days and the stir fry is a lot better :). I have a recipe coming soon. Like the sound of these sweet potato noodles. Very interesting. Need to try out someday. Thanks Lail. I hope you do, they are really quite good.